This Chorizo Fresco is from a new book, Charcutería: The Soul of Spain. 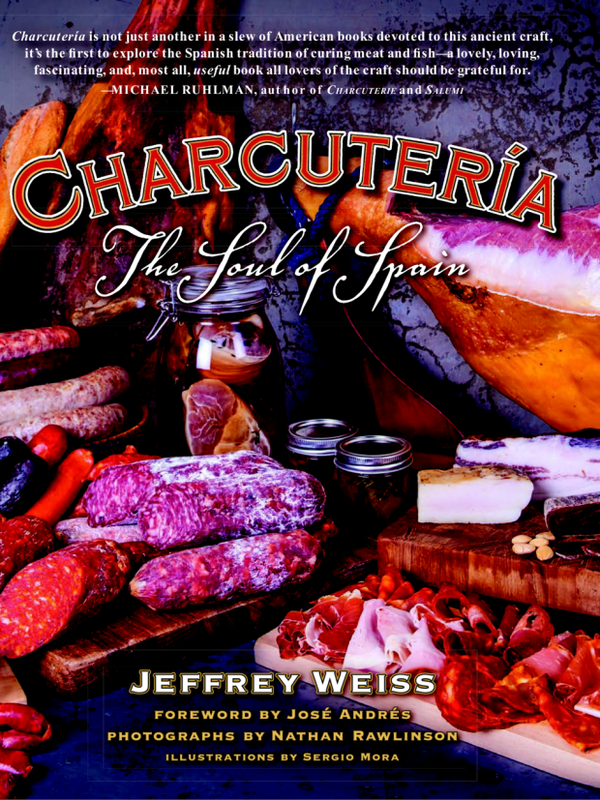 In this stunningly photographed book, the author, Jeffrey Weiss, explores the various regional authentic Spanish meat curing techniques and recipes. The book covers the history of Spanish butchery, including how the tradition survived the occupation of Iberia by the Moors. It is clear that the author cares deeply about this topic after having immersed himself in the tradition. If you have an interest in meat curing and/or would like to learn more about Spanish Charcuteria, this book would be the ideal resource, short of spending a year in Spain. To see photos of the finished chorizo, visit Nic Cooks. This is Chorizo 101: Class is in session. This incarnation is the most basic form of a Spanish-style chorizo sausage, a raw amalgam of its more famous dry-cured cousin with all the smoky-garlicky punch and none of the waiting times or space concerns. It’s perfect for those who are averse to dry curing or for beginners who want something tasty for dinner. 1. Place the aguja, panceta and papada meats and grinder parts in the freezer for 30 minutes to par-freeze before attempting to grind. 2. Using a mortar and pestle, crush together the garlic and salt to form an ajosal. If desired, you can finish the ajosal in a food processor fitted with the “S” blade. 3. In a mixing bowl, combine the meats and ajosal. Toss together and set aside as you set up the grinder. 4. Fill a large bowl with ice, and place a smaller bowl inside the ice-filled bowl. Grind the meat mixture one through a medium-coarse (9.5 mm [3/8 inch]) die into the smaller bowl. Be careful: The meat is wet, so it may squirt and pop out of the grinder. 5. In a small mixing bowl, combine the wine, water, pimentones, and oregano, making a slurry. Keep the bowl containing the slurry chilled until ready to use. 6. Place the ground meats in the bowl of a stand mixer fitted with the paddle attachment (or you can just mix in a mixing bowl with a sturdy spoon.) Begin mixing on low speed. As the mixer runs, pour the wine slurry into the bowl in a steady stream. 7. Continue mixing on medium speed for 1 to 2 minutes, until the wine slurry has been fully incorporated into the mixture, a white residue forms on the sides of the bowl, and the mixture firms up. Place the bowl containing the ground meat mixture into the refrigerator to keep it cold until you are ready to stuff the sausage into casings. 8. To make a prueba, in a small skillet over medium–high heat, warm 1 tablespoon of the oil. Place a small piece of the meat mixture in the skillet and fry for 3 to 4 minutes, until cooked through. Remove from the heat. Taste and adjust the seasonings to your liking. If not stuffing: Form the mixture into 8-ounce (226-g) patties. Wrap in plastic wrap or caul fat, if using. Place in the refrigerator to ferment overnight. If stuffing: If you have stuffed the sausages into links or loops, warm the remaining oil in a large skillet over medium–high heat and fry for 8 to 10 minutes, until they register an internal temperature of 150°F (65°C). You can also oven roast or grill the sausages at 350°F (180°C) for 20 to 25 minutes, until they reach the same internal temperature. If not stuffing: Warm the remaining oil in a large skillet over medium–high heat and fry the sausage patties for 8 to 10 minutes, until they register an internal temperature of 150°F (65°C). Remove the sausages from the heat and serve. Disclosure: I received a digital copy of this book to review and share a recipe. All opinions are my own.